The one who “first encircled my finger with his jewel” refers to La Pia’s husband, Nello, who was responsible for her death so that he could marry a Countess. 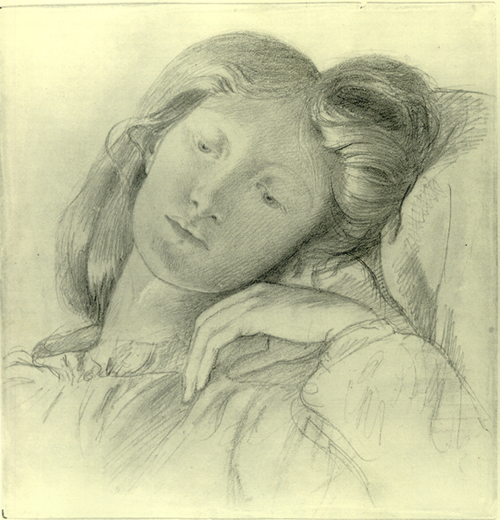 La Pia’s husband imprisoned her in Pietra Castle, which is the scene we see in Rossetti’s painting. 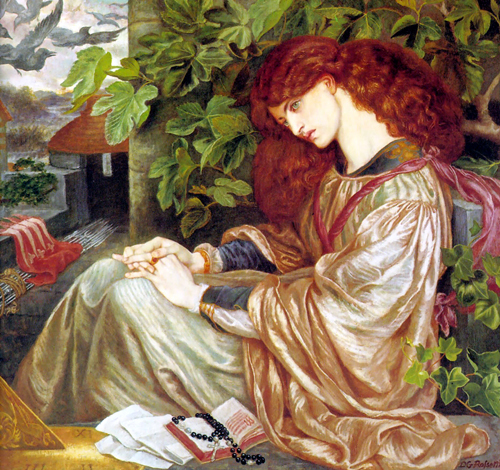 Is Rossetti painting Jane as a prisoner of marriage, just as La Pia was a prisoner of the castle? Perhaps Rossetti is projecting his desire to free Jane and rescue her for himself. No more, farewell, no more! Time passes on as La Pia is imprisoned. We see this with the inclusion of a sundial. To pass the time, we see her prayer book, her rosary, and possibly some old love letters. Most importantly, we see that Jane (as La Pia) lightly fingers her wedding ring, the fair jewel given to her by the husband who trapped and imprisoned her. 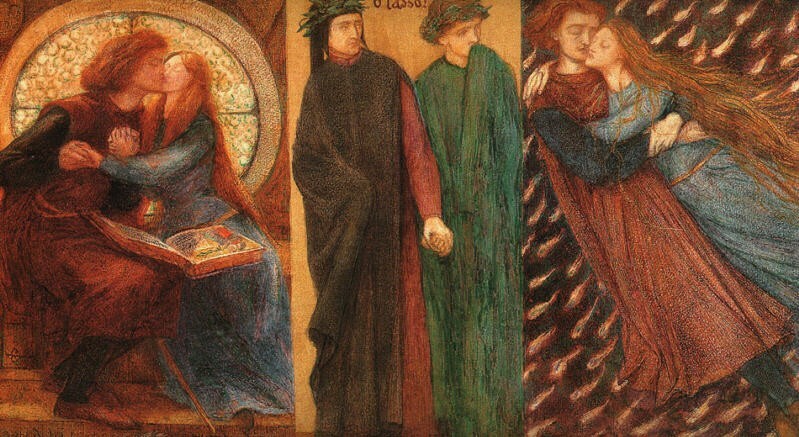 Also see Shades of Dante for more on Rossetti’s lifelong passion for Dante Alighieri. I love everything about this painting. I have featured it on my myspace page for a long time. I,too,am struck by the use of rooks and weapons and all the detailed objects in the proximity of Pia (Jane). I absolutely love the Pre-Raphaelites because they abundantly avail themselves of symbols and myths! Thank you for posting this, Stephanie,I was most curious to find out about the imprisonment of Pia. 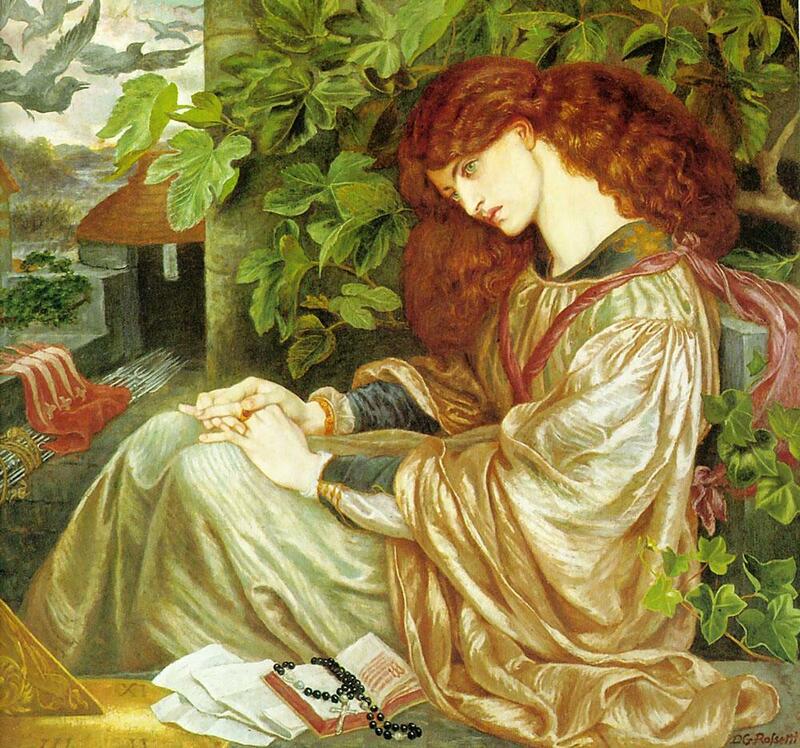 Yes, I think that all of the symbolism is one of the reasons I am so drawn to Pre-Raphaelite art. It invites the viewer in, allowing them to be absorbed by the world that the artist has created. I enjoy studying the paintings, looking for details that I would have missed upon first glance. I know that it is a year later, but I thought you might like to see where Pia was imprisoned in Maremma in Italy. I found your site a year ago as I have a long time love of the work of the Pre-Raphaelites… last year my sister and I queued for 4 hours to see the Exhibition in London. Needless to say it was wonderful. You could have knocked me over with a feather. I love that painting. I teach that painting. I adore Rossetti. And here we would be in the middle of Kansas, tearing down the Interstate, and we would’ve driven right pass it. Thank God for this sweet woman. Tomorrow, we are swinging by and checking out Rossetti. I’m so excited. Well what a beautiful ‘coincidence’, is this the first time in your life that such an uncanny event has taken place? I think not.